I’ll be trying out something a little different today. Many MTG websites have been talking about how the reprints will affect prices of those staples in the long term, but there has been little focus on how these reprints will affect the state of modern as a whole. Today I’d like to take a look at all of the major decks in the modern format and hypothesize how the addition of reprints or a card not being reprinted will affect prices overall. This is purely speculation of course, but just as always I will explain my reasoning and if you think it sounds good then by all means please go out and buy these cards. The best way to use this article is to help you decide whether NOW is the time to build that modern deck you always wanted to or wait. For some of these cards, it’s better to pick them up before a spike happens. Affinity is a deck that is near and dear to my heart. I’ve been using it for almost 2 years so I know the cards inside and out. Modern Masters 2 brought us Darksteel Citadel, Mox Opal, Etched Champion, Blinkmoth Nexus, and Cranial Plating. Mox Opal was the card needing the reprint the most, and it’s dropped from its high of about $60 all the way to around $35 now. This should make it a lot easier to get into the deck as most of the other cards are commons and uncommons that can be picked up rather cheaply. A lot of these commons/uncommons were just reprinted in standard so their supply will be very high right now. 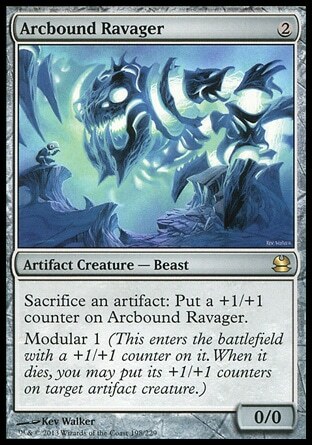 Arcbound Ravager was reprinted in the first Modern Masters set, but as we now know, that set was not printed as heavily as MM2 was. This card is one of the most important cards in the deck and is a 4 of, so if we get a sudden influx of Affinity players I could see it going from its current price of $22 to about $30 easily. That Modular mechanic pretty much ensures it won’t be reprinted in a regular set, but we might see it down the road in 3-4 years in some sort of supplemental product. I got a few extra when they were at $17 and I’m sitting on them for the long term. It could start showing a profit by the end of this year. 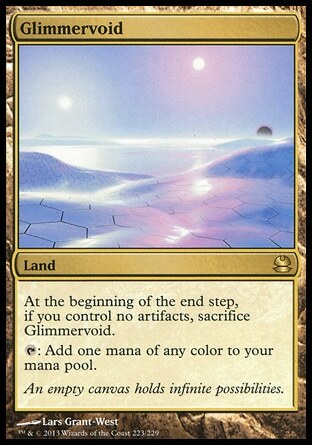 Glimmervoid is usually a 3-4 of in an Affinity deck, and with supply coming from only 2 printings I think this will be another card to look out for. It’s $11.50 now which really hasn’t changed since Modern Masters 1 came out. I’m NOT saying this card will go up to $20 or anything, but I am saying that the price can gradually creep up as more people make an Affinity deck, and it’s very susceptible to price spikes. 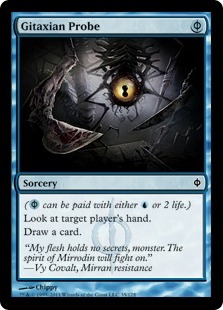 It also would have a very hard time getting printed in a regular set outside of a Mirrodin block. Othercards that could be reprinted or might not see as much of a price spike would be Master of Etherium ($5.50) or Steel Overseer ($8). They share relatively the same spot but are metagame dependent so I don’t think the cards will go up much if at all. Twin is the deck built around the namesake of the card Splinter Twin (and sometimes Kiki-Jiki, Mirror Breaker), which was just reprinted in Modern Masters 2015. Other cards found in the deck, Remand and Lightning Bolt, were also reprinted in MM2 but I don’t think that will put too much pressure on other cards in the set. The deck was incredibly popular in the last Modern season, as well as the RUG version with Tarmogoyf which should be come more common now that he was reprinted once again. Luckily, most of the cards needed for this deck to work are at uncommon or common. Pestermite and Deceiver Exarch certainly won’t be breaking the bank, and with Serum Visions becoming a FNM promo that should push down the value of that card a bit. 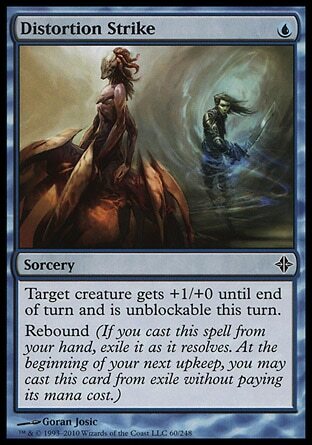 Cryptic Command, Spellskite, and Vendilion Clique were also reprinted, making entry into the UR version even easier. They are still pricey, and cards like Snapcaster Mage are only going to get more expensive, but overall the bite will be about $100 less thanks to reprints. Where I see opportunity down the road is with Gitaxian Probe. It was already an FNM promo which means seeing it there again is unlikely for a while, and with it’s cost being Phyrexian Mana MM2 was the perfect time to print it up again. Right here we’re going to see another Serum Vision phenomenon. It’s a common and only $3.25, but it could easily be double that by the end of the year due to its heavy play in Legacy and a few modern decks such as Twin and Infect. With Zendikar fetchland reprints looming on the horizon this fall, I think increased interest in Twin decks will put more pressure on shocklands. Steam Vents had gone up to about $18 at one time but is now down to a rather low $13.50. Everybody said pick them up before rotation but if you are still waiting to pick up shock lands, now is the time to do it. With modern season here for PPTQs and GPTs, increased demand should push it up. I wouldn’t be surprised to see shocks hit $17-18 by the end of the year if Modern demand remains strong. Other cards to consider for Twin are Sulfur Falls ($8.50), Spell Pierce ($2.25), and Spell Snare ($5.50). The falls could be reprinted easily in a future set I think, as well as Pierce and Snare. There is really nothing holding these cards back so I don’t think they’re going to go up much. I personally haven’t seen many people playing Infect in Nagoya, but I’ve heard around town that one of the reasons Noble Hierarch has been holding it’s value at about $40. People are picking up 4 Hierarch, which means other staples from the deck could be seeing a spike soon. Just as with Affinity, if you didn’t buy your Inkmoth Nexus before the spike to $25 your out of luck. Not bad to trade for if you really need them, but that playset is gonna hurt. Luckily many of the key cards were reprinted: Vines of Vastwood, Apostle’s Blessing, and Mutagenic Growth. This wasn’t really a big part of the value of the deck, but every part helps. Those that weren’t reprinted, such as the creature package with Infect from New Phyrexia, are incredibly easy to get a hold. Blighted Agent and Glistener Elf will cost you almost nothing. I think we’re going to see a lot of movement from Wild Defiance over the next few months. It already jumped from bulk to $3 a while back, and it’s currently close to $4. This could possibly be released in a set later this year or next, but I don’t think we’ll see it back in standard for a while. 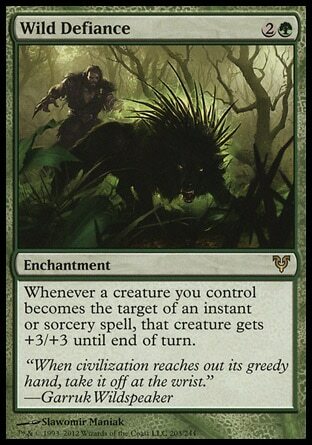 I believe Defiance is looking to double by the end of the year, and possibly hit a $10 peak if Infect does better. If people buying up Hierarchs in Nagoya are just the beginning of the trend, we could see these disappear a lot faster. Get them now if you want to build Infect. Might not be bad in trades either. Pendelhaven is only a 2 of in the deck, but I think it would be hard to reprint in a future set outside of some sort of supplemental product. It’s already been printed 3 times (FNM, Legends, Time Spiral), so I don’t think it will be back in a major set again. It’s legendary which makes it hard to print, and it is also a very niche card. It’s $11 now, but this sort of card could shoot up to $15-16 if Infect becomes more popular due to it’s limited availability. Dragons of Tarkir would have been a great set to reprint Distortion Strike in, but for some reason they passed by putting this 3-4 of Infect card into the set. Perhaps Rebound will be back in another set in the near future to link with DTK’s ability, but I don’t think that will be the case. At $2.50, Distortion Strike could easily double in price to $5, if not higher when the deck takes center stage in the future. I don’t see it in a large set, but this is another candidate to be featured in a supplemental item in my opinion. Might of Old Krosa is up to almost $9 now, but out of all of the cards that could possibly get a reprint I think it’s this one. It sounds just generic enough and its ability doesn’t have anything linking it to any one world. There is a good chance it will be reprinted in Zendikar. I’m going to lump both Jund and Junk together because they share a lot of the same cards. Lililana of the Veil and Tarmogoyf see play in both builds, as does Abrupt Decay. Where the Junk build differentiates is with removal. Jund has Lightning Bolt and is now using Kolaghan’s Command and Junk uses Path to Exile and. Lingering Souls is another card that Junk plays that that Jund doesn’t. Dark Confidant is starting to see a little bit more play now in the more controlling versions of the deck, and the reprint of Tarmogoyf further makes it open to more players. Fulminator Mage sees a lot of sideboard play in these decks as well, so its reprint is also welcome. Verdant Catacombs should also be back this fall, so the mana shouldn’t be to bad in this deck either. Where I see an opportunity in Jund and Junk is in their spells. You can still get in while the getting is good. 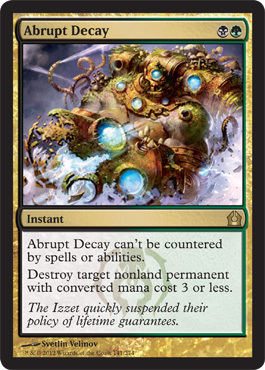 Decay is still only $15 despite seeing heavy legacy play and play in a variety of modern decks. This card will easily hit $20 by the end of the year, and could possibly see $25 by next year if legacy continues to grow in Asia. Get a few of these if you ever plan on playing GB colors. I say this in every investment article I write, but let me say it one more time: BUY THOUGHTSEIZE NOW. Those of you still able to buy it at its current price of $23 are in paradise. It’s anywhere from 3500 to 400 yen ($32-37) in Japan, and as soon as rotation hits the Theros version will easily hit $30 if not more. It sees so much play in Modern in both Jund/Junk decks and in sideboards of various other decks that you can’t got wrong stocking up on them. 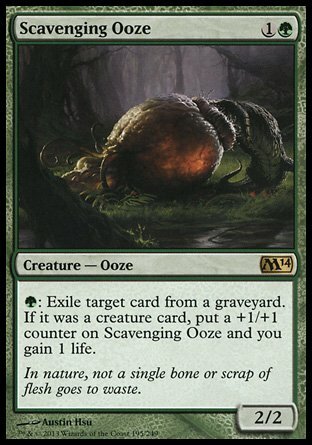 With Tasigur and other cards with Delve picking up steam as well as Abzan Company decks using the likes of Murderous Redcap and Kitchen Finks to win by comboing out, I have a feeling Ooze ($5.50) will become an important part of both Junk and Jund. It will be a slow rise, but this is another card I could see hitting $10 by the end of the year. It’s staying steady between $10-15 in Japan already, and I don’t expect it to change any time soon. Path to Exile was reprinted in both MM1 and the BW Token supplemental deck but it is still holding onto a $8 price tag. I don’t think it will be that high for too much longer. It’s getting a FNM promo this summer, and it could possibly be reprinted in a major set like Battle for Zendikar this fall as well. 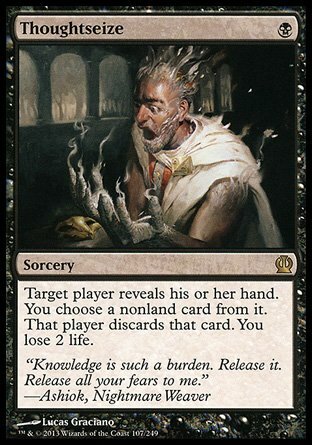 Inquisition of Kozilek just keeps going up and has recently hit $10 and if there was any card that deserved to be reprinted in BFZ it’s this one. If you don’t already have yours, just wait it out. They’ll be back. If you do have them and aren’t using them, I’d get out in the next few months before BFZ. Mono red burn is pretty cheap to build when you’re focusing on just the burn spells themselves. Rift Bolt, Lava Spike, Lightning Bolt . . . they’ve all been reprinted recently or are so cheap it’s not really worth worrying about. 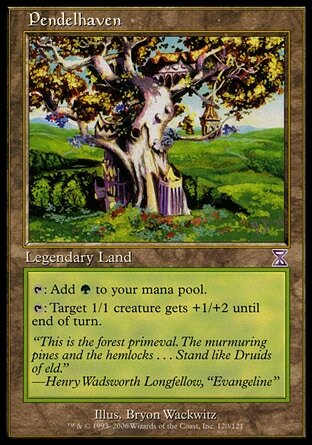 What makes the deck more expensive are the fetch lands such as Arid Mesa and Shocklands, but that shouldn’t be a problem for long. Heck, Sacred Foundry is a steal at $12 right now. Goblin Guide is still a little pricey now at $26, but I think he has a reprint coming pretty soon that will bring that price under control. You can also play cards like Monastery Swiftspear which make the deck even cheaper for the budget minded Modern player. 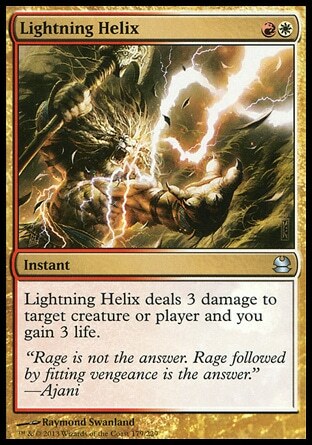 Lightning Bolt was really the only card in MM2 that burn could use, but its sideboard also became a little bit better due to Smash to Smithereens reprint too. I see Lightning Helix as a good pick up at $4. It sees play in most burn decks, but also sees play in UWR control and almost all Zoo builds. It won’t be a quick gainer, but Helix could be a $6-7 card by next year. Worth getting a playset if you think you’ll play it in the future. I personally would recommend playsets of most modern staples since they are the ones that will most likely shoot up when supply runs low. Burn will always be a force in modern, and players are stocking up on Eidolon in Japan at the moment. It’s $10 in the USA currently, but most places in Japan are now seeing prices of closer to $15. It sees play in both modern and legacy and was in a set that was barely opened so it will be very sensitive to a price spike. I don’t see this card getting a reprint within the next year, so I’m going to put it’s eventual value at closer to $20. Give it a year, but it will get there. Hold onto them if you have them, but if you’re thinking of burn or another red based deck get them soon. Between all the other tier 1 modern decks, I think Burn is the most popular with new players (especially those that don’t have $200+ to spend on the rares of Twin and Affinity). 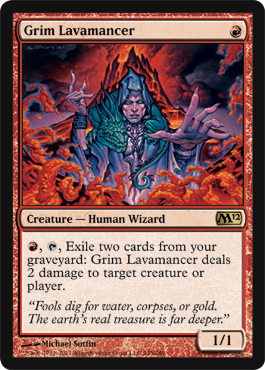 Grim Lavamancer isn’t a 4 of, but lots of players have been making it at least a 2 of in burn decks nowadays. Being only a 2 of means that price spikes won’t effect it too much, but I think it could hit $10 down the road after a year. My only reservation is that it could be reprinted in either Origins or BFZ this fall. 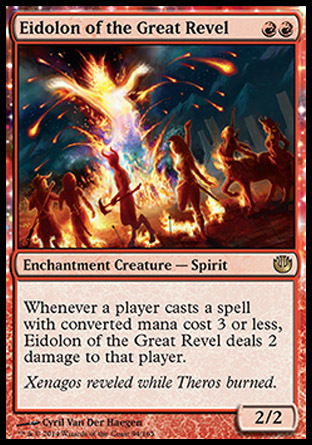 Its ability acts like Delve which would be interesting to see with both Fetch lands in standard and a lot of red one drops rotating in the fall (Firedrinker Satyr, Foundry Street Denizen, etc). It’s $6.25 now, but if it doesn’t show up in the fall set I think it would be a good pick up. You could use it in the sideboard of a few other decks as well. I was debating whether or not to put Tron in Tier 1 or Tier 2, but since it’s seeing a lot more play these days (thanks to Ugin), I decided to consider it as a tier 1 deck. The reprinting of Karn Liberated has removed a hurdle from those wanting to play it, as well Emrakul, the Aeons Torn. 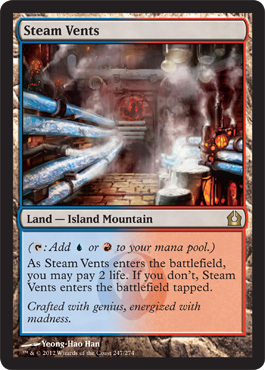 Wurmcoil Engine was also recently reprinted in the Commander 2014 product which makes it even more affordable to play. Tron is looking to be about $100 less across the board, and aside from Grove of the Burnwillows which will set you back about $35 a piece, the deck isn’t that hard to put together. Ancient Stirrings, Expedition Map, and a host of other commons make up most of the rest of the deck. The Urza Lands have had so many printings that I don’t think you’ll have to worry about them either. The more popular pictures will be worth more money, but if you don’t care then you should have no problem. 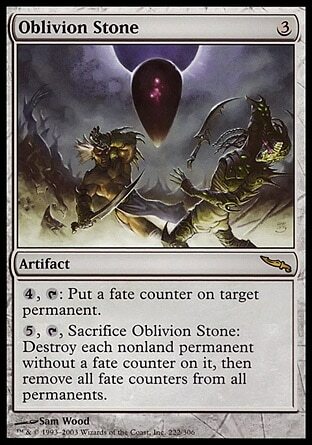 Oblivion Stone seems to be the only card in Tron worth taking a look at. It’s currently up in the air whether or not Ugin or Stone is better, but I’ve personally seen both getting played. Newer players to Tron seem to be trying out the deck with Ugin, but the holdouts from before are more comfortable with Stone because of the instant speed removal. It’s currently $17 which is alright. I’ve seen it as high as $25, but I’m not sure if this card will see any movement soon. Perilous Vault is currently in standard and is designed similarly I think, which means there is definitely room in a future set for a reprint. I’d hold off on picking these up right now if you’re not building Tron, but keep an eye on them. I was originally planning on doing both Tier 1 and Tier 2 decks all in one article, but I ended up having a lot to talk about with today’s article. Next time I’ll be covering the Tier 2 decks Merfolk, Abzan Company (podless Pod), Delver decks, UW/x control decks, Scapeshift, Amulet Bloom, and possibly Zoo/GW Hatebears. I’d like to hear what you think about today’s decks, especially if you play with them a lot. I personally only have experience with Affinity, so being up to date on various tech and how new cards are affecting these modern decks would be great. Please leave your comment below with your reasoning and I just might add it to this article! Hopefully I can get the next article out by Monday, so be sure to check back then. Grixis Delver is definitely tier 1 atm, where the other delver decks Jeskai UR and Esper are probably tier 2.